Paintball Guns come in a variety of styles. We have cheap prices on hundreds of Paintball Guns for sale. We stock the best paintball brands such as Tippmann, Planet Eclipse, Dye, Empire, Spyder and more. Free Shipping Available on most paintball gear. No Duty or Brokerage. When buying a paintball gun, you want a paintball marker that offers the performance and features that suit your playing style. 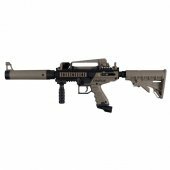 You will find cool paintball guns, cheap paintball guns, sniper paintball guns, paintball pistols / paintball handguns, paintball pump guns, tactical paintball guns and the best paintball guns money can buy. With so many models to choose from, finding the right paintball gun to suit your needs can be overwhelming. Badlands is here to help, start a live chat and we can quickly answer your questions. Paintball Guns There are 119 products. 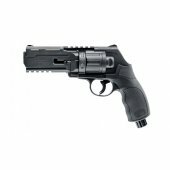 Azodin Paintball offers great starter guns at affordable prices. These cost effective markers make it possible for the player on a budget to still have the quality and cool factor of a more advanced gun. Azodin Paintball offers a full manufacturer warranty and are built to the highest quality standards. Pick up one of these great paintball guns and hit the field today! 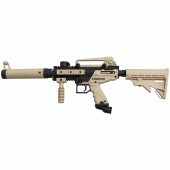 Badlands paintball stocks more Dye paintball guns than any other paintball store in Canada. As the largest Dye paintball dealer in Canada, we are your best choice for the full selection of what Dye has to offer, stocking every model, and every color of the Dye DAM paintball gun and the current line of DM paintball guns. 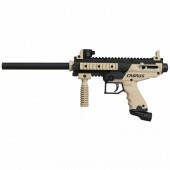 Badlands sells more First Strike paintball guns than any other paintball store in Canada! Our First Strike options are mag-fed which are very popular among Milsim and Woodsball players alike. If a player prefers to take the hopper-fed route, they can use the optional feedneck attachment for the T15! Badlands is the top supplier of Killhouse Weapon Systems upgrades and guns! Killhouse Weapon Systems, often abbreviated to KWS is a top manufacturer of paintball and airsoft upgrades. Killhouse Weapon Systems produces the top end Headhunter series of paintball barrels, as well as the popular Tactical Paintball Barrel line. Badlands is proud to be the Official distributor for Planet Eclipse paintball guns in Canada. We sell more Egos, Geos, Eteks, and Etha paintball guns than anyone else in the country. We are the Planet Eclipse Warranty Center for Canada, and we have the only factory trained Eclipse techs as well. Proto Paintball manufactures tournament paintball guns for players of all skill levels. Badlands Paintball stocks both the Proto Reflex Rail paintball gun and the Proto Rail paintball gun. Utilizing technology found in high end DM series markers, Proto paintball guns are able to pack a lot of performance based technology into a very cost effective package. Badlands is the Canadian Distributor for Spyder Paintball guns. Spyder Paintball guns are a great choice for players of all levels looking for a reliable blow-back paintball gun. 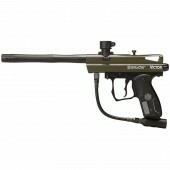 Spyder paintball guns with the EKO valve are the most efficient blow-back paintball guns on the market today. Tippmann backs their A5, Platinum, X7, and TPX paintball guns with a 2 year manufacturer warranty against defects in material or workmanship. The Tippmann Bravo One paintball guns come with a 1 year manufacturer warranty against defects in material or workmanship. Cheap paintball guns are a great way to get started when choosing your own equipment for the first time. Having your own equipment is a huge step up from rental paintball guns that get a lot of use. We stock cheap paintball guns that are durable and easy to maintain. Paintball pistols also known as paintball handguns are the most versatile paintball gun for the ultimate woodsball operator. It pays to have a dependable back up in your arsenal in case your primary paintball gun runs out of air or springs a leak. Pump Paintball Guns came before semi automatic paintball guns. They are kind of like a paintball shotgun. Pump paintball guns are great if you want to focus on accurate shooting. It can be more challenging to play with a pump when you are against semi autos, however you can get great satisfaction when you make eliminations. Some paintball parks will offer special events for pump players. Pump paintball guns are available as cheap paintball pump guns all the way up to the best high end pump guns. Start making long range paintball eliminations with a Sniper Paintball Gun set up. Get a sniper paintball gun to gain the upper hand when you need to even the odds from a distance. You can effectively engage and eliminate your opponents from a range that keeps you safe. 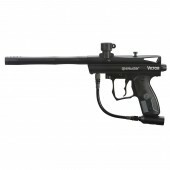 Since 1988 we have been the trusted source for Canadian paintball players looking for a paintball gun. Whether you are a new player looking to get your very first paintball gun, or a seasoned veteran who is looking for some serious firepower, we are certain that you will find something in our vast selection that will be that perfect fit. Tippmann has been making paintball guns since 1986 and they have always had the reputation of being durable and reliable. From the beginning, Tippmann paintball guns have been the first choice of many paintball field operators, and paintball players, alike. Whether you are looking for a simple, mechanical blow-back style marker, or a more sophisticated electro-pneumatic paintball gun, Tippmann has something to offer, with prices ranging from $129 to over $600 for a fully accessorized paintball gun. Badlands has been carrying Tippmann paintball guns since 1988, when we opened as Canada's first paintball store. The inception of Planet Eclipse actually began as a small retail store called Paintball Planet in Manchester, England around 1994. 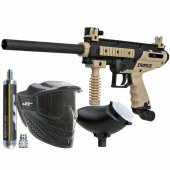 Paintball planet sold equipment and upgrades for the existing paintball guns of the day. Their big break began around 2002 with the famous E-Blade upgrade for the autococker paintball gun. 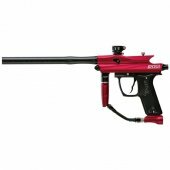 This revolutionized the autococker and initiated the development of higher performing autcocker paintball guns. Fast forward to the present and we have the line of amazing Planet Eclipse paintball guns such as the EGO LV1.1 PRO, EGO LV1, GEO 3.5, ETEK 5, and the ETHA. As the Canadian distributor of Planet Eclipse, Badlands maintains a large selection of the latest Planet Eclipse paintball guns and paintball equipment in stock. Planet Eclipse has developed and produced some of the highest performing paintball guns across all types of valve designs including the poppet and spool valve engines. There isn’t a paintball gun in the market that can outlast the bullet proof durability and high end performance of a Planet Eclipse paintball gun. Designed to appeal to the the entry level player who wants a paintball gun that is reliable, affordable with a sleek ergonomic design. The Azodin paintball guns are designed based on simplicity and durability. Using common orings, repairs are easy and spare parts are available at most paintball parks, so if you run into any troubles you can get a quick repair and return to battle. Other advantages include a standard autococker thread used by most high end paintball guns. Go ahead and upgrade the barrel now and you can use on another gun in the future. Check out each model of Azodin Paintball Guns for specs and benefits. Battle Tested (BT), Empire’s division of scenario style paintball guns and equipment has long been outfitting paintball players with the best gear to play scenario paintball. With their flagship markers like the BT-4 Combat and TM series paintball guns, BT always keeps up with the necessities of the scenario paintball player. With a large assortment of paintball gun variants, you can get exactly what fits your play style as a scenario paintball player. If you want a rugged paintball gun that needs little maintenance, the BT-4 Combat series is for you. If you are interested in high performance machines, look into the TM Series and D*Fender paintball guns. No matter what your goal is, there is a BT paintball gun to help you be an effective player in a scenario paintball game. Since its foundation in 1994, Dye precision has been making top of the line paintball products with high end performance as its main priority. They are known for their incomparable lines of paintball guns, paintball masks, paintball hoppers and paintball clothing. Dye paintball has a flagship product in every aspect of paintball equipment such as the DM series paintball guns, the Dye i5 paintball mask, the legendary Dye rotor paintball hopper and their line of Dye UL paintball clothing. Dye paintball constantly pushes the limits of modern day paintball technology. The DM series paintball guns have been an evolution with almost twenty years of perfection at its core. Dye paintball continues to evolve their products to bring you some of the best equipment in paintball. Empire Paintball is one of the worldwide leaders in the manufacturing and distribution of paintball sporting goods. Dedicated to quality and craftsmanship, Empire Paintball embodies the sport of Paintball – Life, Function, and Style. Supplying numerous professional and recreation paintball teams, their products can be seen on almost any paintball field. This is with good reason; Empire Paintball produces products that fit the needs of every player no matter what age or skill level they are. Badlands is the largest dealer of Empire Paintball and keeps a huge variety on hand of all of the latest Empire paintball guns such as the Vanquish, Axe Pro, Mini GS, D*Fender and may more. Killhouse Weapon Systems has teamed up with BT Paintball to create the already amazing line of BT Omegas into Killhouse Weapon Systems enhanced paintball guns. Get a combination of durability from the BT Omega and the increased performance of Killhouse Weapon Systems tactical upgrades. With the Killhouse Weapon Systems Headhunter paintball barrel, you will discover your paintball flying straighter than ever with a tight target grouping. Let your opponents quiver when they see that you have come prepared with a performance enhanced Killhouse Weapon Systems BT Omega. Beginning in 1992, after establishing its reputation with the Hammer series pump action marker, Spyder continued to completely change the scope of the sport of paintball with its now legendary semi-automatic series. Since then, Spyder has been known for its reliable and affordable paintball markers and dedication to promoting the sport of paintball. Spyder® continues to work closely with the most highly skilled engineers to create paintball products with innovative features including the Eko™ Valve system which offers the most extreme air efficiency available on the paintball market, “DLS” Dual Loading System enabling you to interchange your loading system with a quick turn of the barrel and First Strike™ paintball equipped option for advanced accuracy and long range.